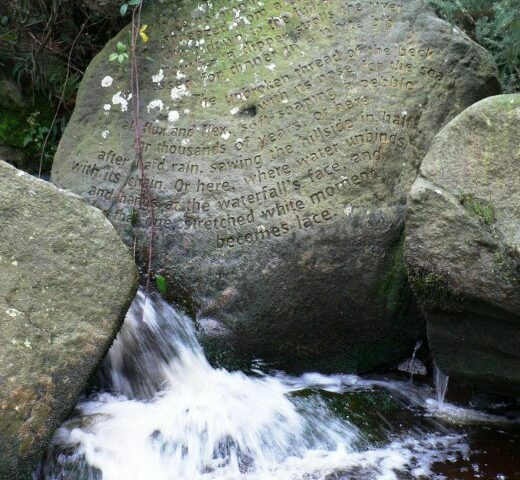 ‘Beck’ is one of seven poems carved on rock and located in moorland in the South Pennines area of Yorkshire. 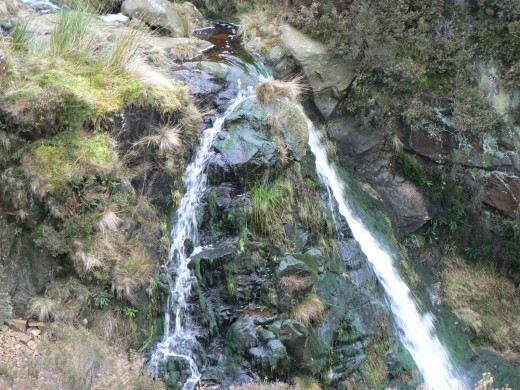 All the poems, written by Simon Armitage, feature water in one of its many forms. (Images: all the photos you will see have been taken by me). 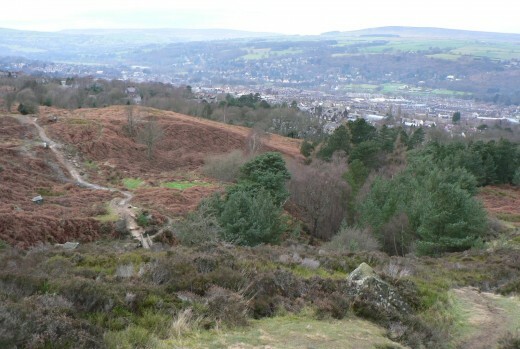 Backstone Beck rises high on Ilkley Moor and in its short course to join the River Wharfe in the valley below it tumbles down deep ravines scoured into the peat. 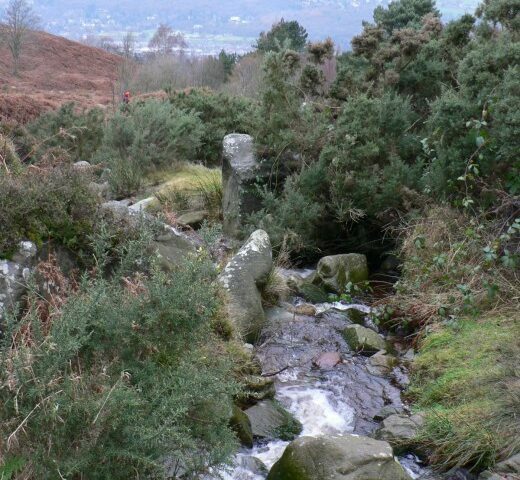 A footpath runs for most of its course alongside the beck and, about half way down the hillside, a path through the gorse leads you to a twist and dip in the stream. 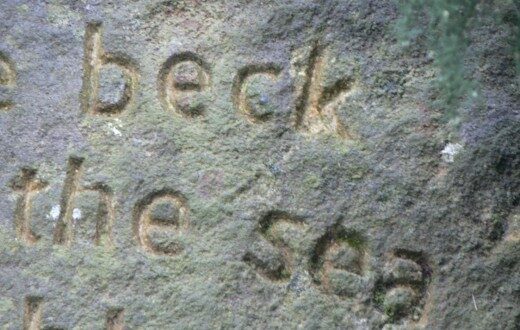 On the rock is a poem: ‘Beck’, written by the Yorkshire poet, Simon Armitage, and carved – ten minutes per letter – by stone artist, Pip Hall. 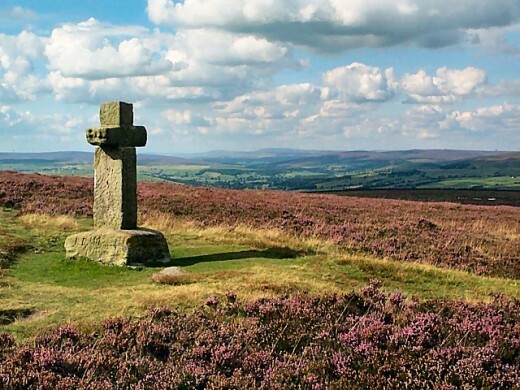 It is one of seven ‘Stanza Stones’ – poems in stone – and located on Yorkshire hillsides in the South Pennine area. 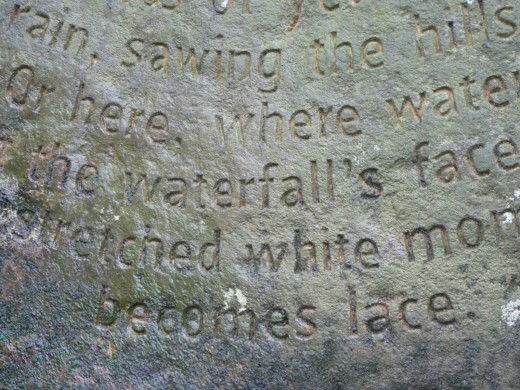 This particular poem was carved in situ, a difficult and physically demanding task for Pip Hall, requiring her to stand at least ankle deep in water on each occasion. The stone is curved smooth by years of water and the words twist and swirl over its face. 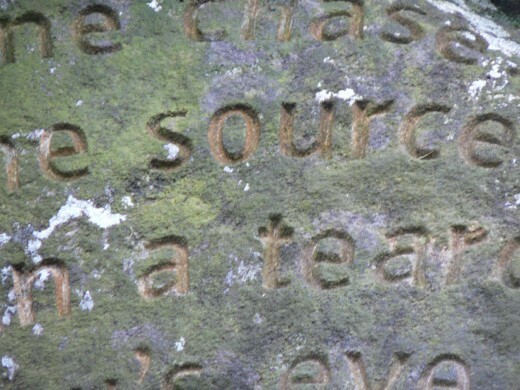 Although the poem is less than two years old, the water has already begun its erosion, grinding away at the letters; algae is building up in their crevices. A heavy flood could cause a landslip at any point in the ravine, so there is a sense of both permanence and insecurity about this work. 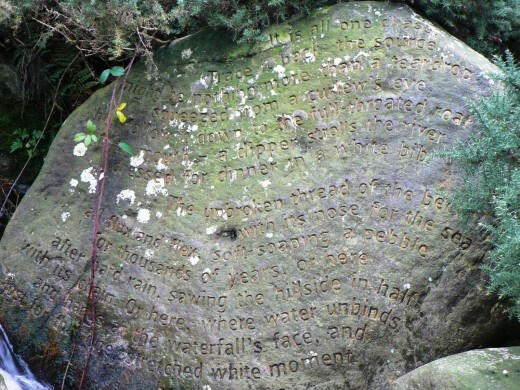 In this respect, Simon Armitage has said of all the Stanza Stones “They may be written in stone, but the elements they describe will eventually render them mute”. Simon Armitage’s poem is shown below. It is all one chase. 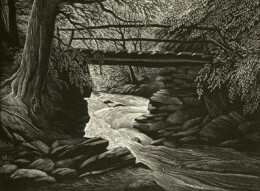 Armitage captures the force of the beck after heavy rain: its “full-throated roar”; its destructive power: “sawing the hillside in half with its chain”. 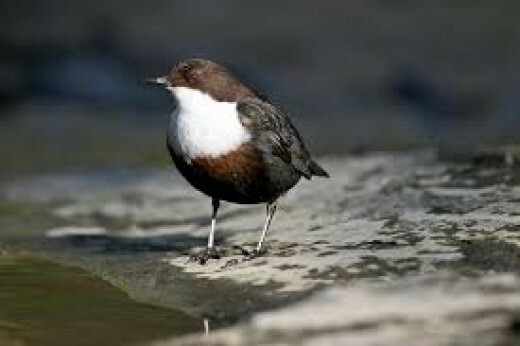 “At its mouth: a dipper strolls the river dressed for dinner in a white bib”. The Stanza Stones project came to fruition in 2012 after two years of planning and hard work. 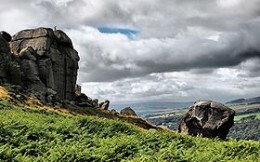 It was commissioned by Ilkley Literature Festival and financially supported by a grant from the National Lottery. 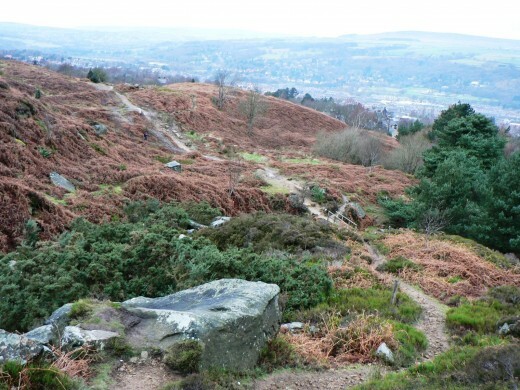 There is now a Stanza Stones trail of short individual walks, or one that can be extended over 40+ miles, connecting all the stones (link below). All, that is, except one. 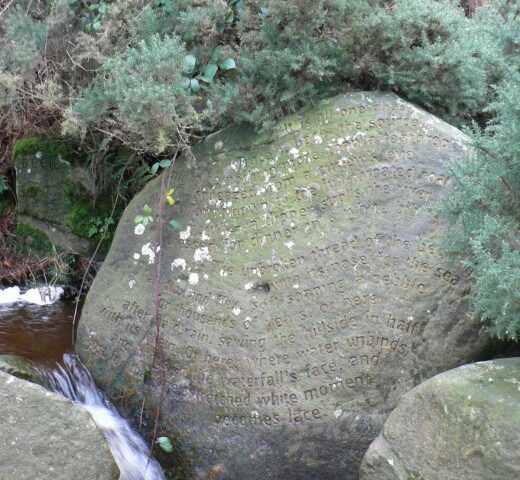 There is a seventh Stanza Stone with the simple inscription, ‘In memory of water’, hidden away on a hillside somewhere. It is yet to be discovered. A short film: Simon Armitage talks about the challenges of writing the Stanza Stones project, his aims, and thoughts on the way the poems may be received in centuries to come. Click on the link below. 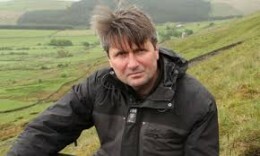 Simon Armitage talks about the Stanza Stones project and recites one of the poems. 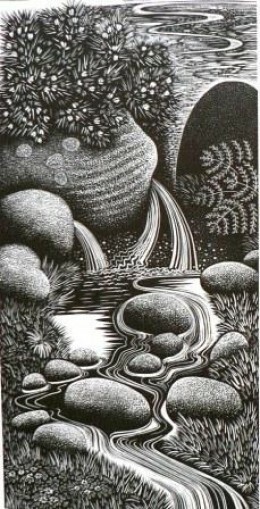 This wood engraving by Hilary Paynter is one of seven reproduced in a limited edition (186 copies only) book celebrating the Stanza Stones project. 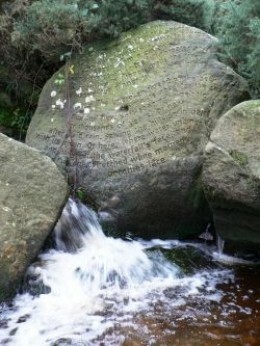 In Memory of Water contains all the poems, details of their location, and the wood engravings. It was published by Andrew J Moorhouse of Rochdale, England in 2013. Hilary Paynter is one of Britain’s most accomplished wood engraver. She visited all the known Stanza Stone locations to make preliminary sketches and drawings for her engravings. 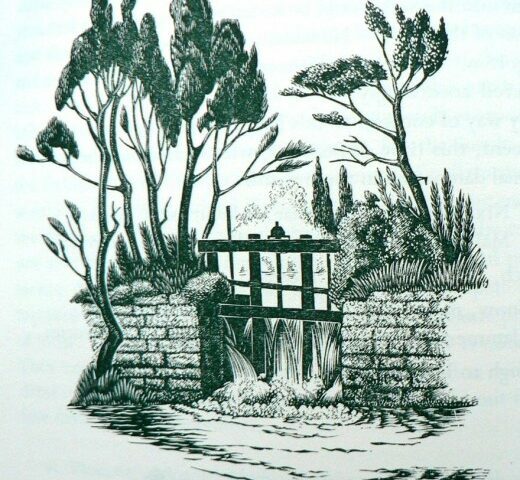 Water scenes can lend themselves to wood engraving. 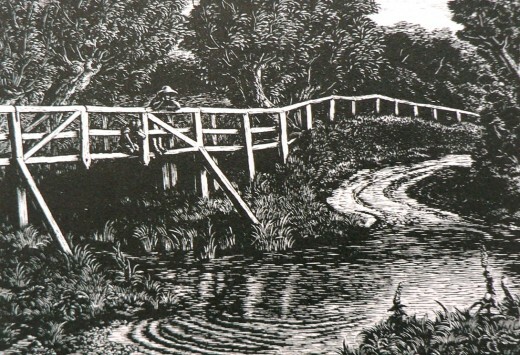 Have a look at six other wood engravings (below) depicting river or stream scenes. Which do you like best? 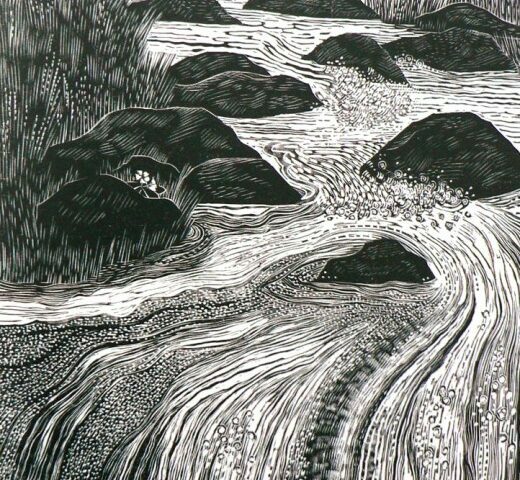 Wood Engravings of Rivers and Streams. 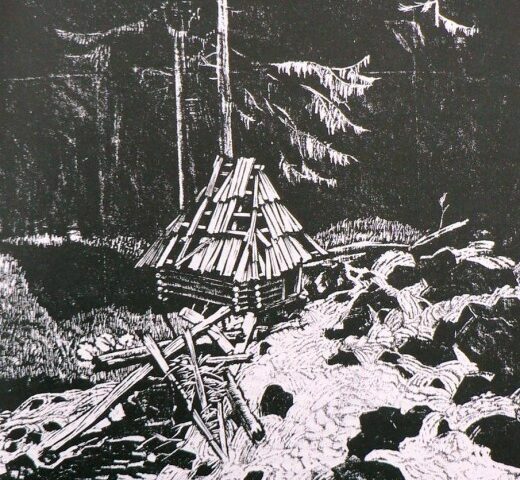 Which wood engraver’s work do you like best? I sell books online, including ‘In Memory of Water’, and other books about the Stanza Stones.